The Bay Area is magnetic, and as our population increases, BART’s goal is to make sure growing pains don’t get in the way of either new opportunities or your destination. We have begun laying the groundwork to upgrade our computer equipment from Pong-era technology to a modern train control system—which means less waiting for trains on crowded platforms and less frustration from delays. New train cars are also being added to our fleet—visit the project page at www.bart.gov/cars to learn more. How you get to BART matters just as much as how BART gets you to where you need to be. We've begun improving customer access within and around our stations—from improved parking availability, to new escalators and elevators, to bike stations. BART is for everyone and all abilities, and we want to ensure that nothing comes between your front door and a seat on a BART train. Building housing developments near BART is a major priority for Alameda County. This transit-oriented development means freedom from car culture and convenience for residents. BART is exploring parking options in the Tri-Valley area—but not just for cars. Bike stations and bus access are slated for development throughout the BART system. Important earthquake retrofits will continue so our system can withstand the big one and get back up and running quickly. Station improvements, like the glass canopied station entrance at 19th Street Station in uptown Oakland, are changing the face of BART and helping protect escalators from damage. We are replacing power cables and substations that help power our train. Power infrastructure is key to keeping everyone moving. BART to Antioch is now open. Shiny new state-of-the-art trains are taking cars off Highway 4 and providing a clean and comfortable ride. BART is exploring parking options for at-capacity stations in Contra Costa—and station access projects from bus lanes to bike stations are slated for development throughout the system. Replacing broken escalators is part of our plan to provide safe, reliable service to customers on our busiest line—Antioch to SFO. The BART Caldecott Tunnel is slated to get necessary earthquake fault creep repair. Solar panels at Lafayette and Antioch station have been installed to shade your vehicle and power the station. A modern train control system means less standing around on platforms and more frequent train service to whisk you away to your destination. Bike Station expansion allows people to get to BART on their own time, their own way. Check out Civic Center’s Bike Station to see what BART is already doing for cyclists. Replacing broken escalators is part of our plan for system reinvestment—Market street elevators are currently being replaced. Canopy station entrances—similar to the one at 19th Street Station in Oakland—are coming to Market Street. Construction of new turnarounds and extra tracks mean delays won’t affect service as severely as they do today. BART is vital to the Bay Area, but the cost of replacing so much of our system adds up quickly. Figuring out how to pay for our needs has been a lengthy and difficult job, yet throughout this process we’ve dedicated ourselves to transparency, responsibility, and integrity when it comes to funding our future, and we're grateful to voters for saying YES to a future of safe, reliable transit. 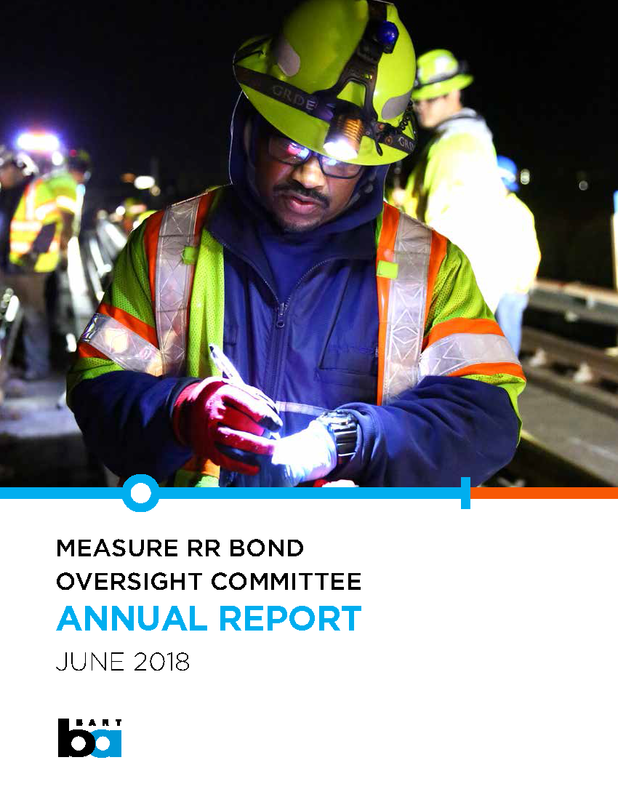 The Measure RR Bond Oversight Committee has produced its first Annual Report as of June 2018. It's full of information about how Measure RR is off and running to Build a Better BART.